Updated Thursday April 13, 2017 by AUBL Miami. Hello Everyone!! My name is Joe Winkelsas. I am an Associate Scout for the Atlanta Braves. I am here in Florida until the middle of May. As a 15 year former Affiliated Pro Baseball Player for the Braves, Brewers and White Sox, I have picked up some beneficial things along my journey/way. The human arm was definitely not made to throw overhand. Every time your arm moves at a tremendous rate of speed through the air, you are causing tiny micro tears resulting in future damage. Think of your arm like you think of an automobile after a long trip your car…it’s important to fill up on new gas and oil so as not to make the car break down. I am happy to say, for this very reason; I have created an incredible Power Arm Program that gets amazing results. There has been exhaustive research, studying and testing that has gone into this program. 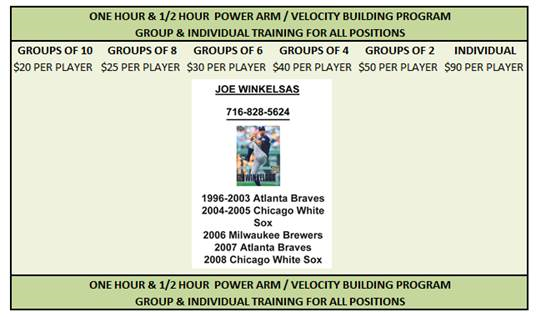 The Power Arm Program will provide you with a velocity increase, flexibility, and proper mechanics that suit your body type.